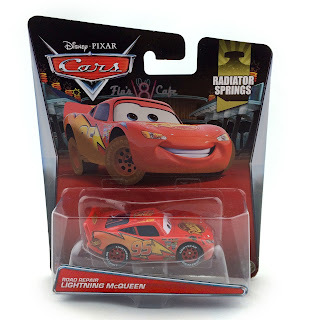 New for 2015, here we have the 1:55 scale diecast of Road Repair Lightning Mcqueen! 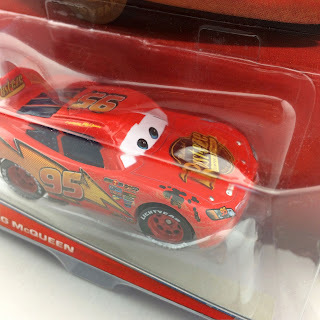 This version of the famed race car has just been released by Mattel and is #13/19 of this year's "Radiator Springs" sub-series. As shown in the screen shot above, this Mcqueen is based on the scene in the film when he is paving the town's new road by pulling Bessie- and then gets a splatter of tar on him! This release is very similar to the 2008 "Tar Lightning Mcqueen" (seen HERE), but is technically new. The tar splat on his hood has been improved to look much more like the one in the film and a new subtle dirty paint job has been added. I just found this one last month at Walmart, so it should still be making its rounds in stores. If you'd rather just pick it up online, visit eBay HERE or Amazon soon (it's not in stock quite yet over there). Good luck on the hunt!